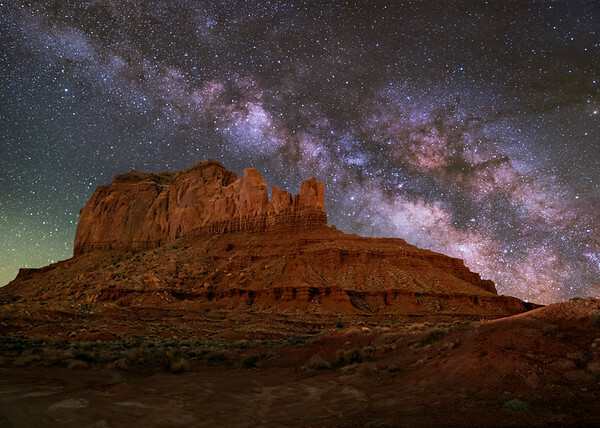 The Monument Valley Landscape Astrophotography Workshops are given in association with WorldPix, a charity organization that promotes and uses photography as a way to make a difference in society. Profits from the workshops will be donated to a local charity through WorldPix. WorldPix believes in the power of a photograph to lead the way to effect change for communities in need. We believe in the power of a photograph to tell a story, to touch a life, to inspire action, to provide insight, and to provide enjoyment. 4 nights - Good shooting hours are roughly 12:30 a.m. to 4:30 a.m.
4 nights - Good shooting hours are roughly 10:30 p.m. to 4:10 a.m.
2) Keep it simple! Teaching will emphasize nightscape techniques that work with single frame acquisitions and panoramas. We will discus image stacking and blended images (separate captures for the sky and foreground), however my goal is to give you techniques for single frame acquisitions that rival stacking and blending. My goal is to teach you techniques for any situation. 3) Emphasize the landscape! We will spend a lot of time on creating a spectacular sky, however my goal is to make the landscape as attractive an eye-catching as the sky. Too often the landscape is an afterthought. A foreground silhouette is beautiful occasionally, but I want detail in the foreground while still making it look like nighttime. The landscape gets equal billing here! 4) Learn a flexible method of processing. We will discuss processing in detail, with 3 goals, A) keeping it simple and straightforward, and B) making it flexible enough to tailor to your vision of nightcaps. 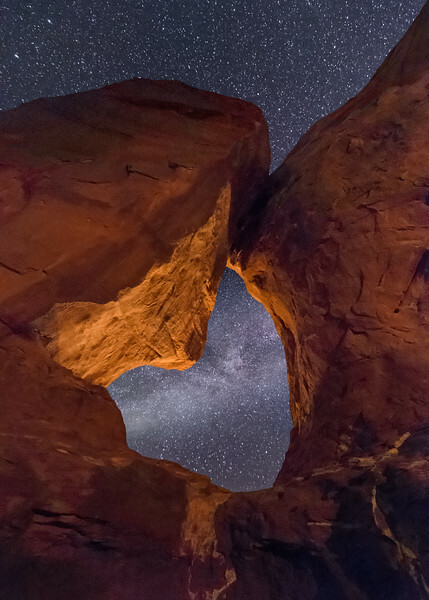 Discussions will involve the use of Photoshop and Lightroom in nightscape processing. 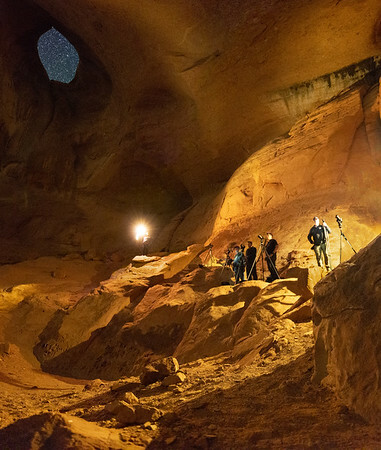 C) Learn how to minimize noise in nightscapes. 5) Learn Low Level Lighting, Techniques and when to use it. One night will be set aside for this. The organization for both workshops will be similar. Each workshop will be a four day workshop. Attendance will be limited to 6 participants in each workshop to allow adequate attention to each person. If one or more nights gets clouded out then we will devote the time to extended teaching and processing sessions. One night will be planned in the main valley, shooting classic structures such as The Mittens and The Totem Pole. We will plan panoramas of The Mittens and a panorama of the Totem Pole. June is ideal for panoramas in Monument Valley! 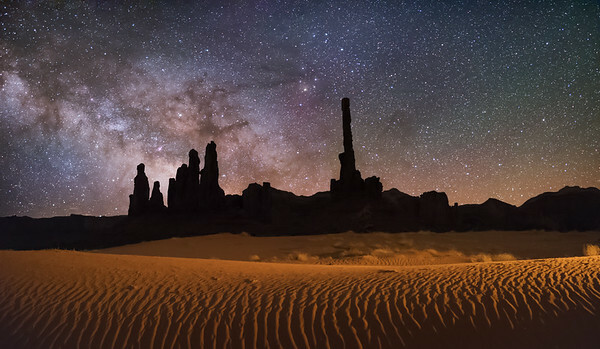 One night will be planned in the Monument Valley "Outback". This area is restricted from normal tourist traffic, and requires a Native Guide to visit even in the daytime. Structures of interest in this area include Big Hogan Arch, Moccasin Arch, and Sun's Eye Arch. One night will be planned for Mystery Valley and/or the area around Teardrop Arch. 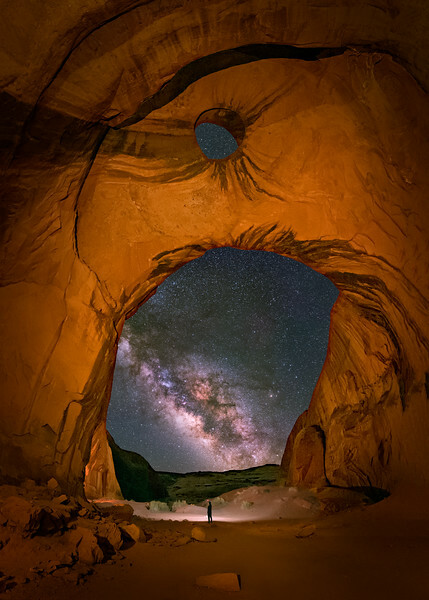 Within Mystery Valley are several Anasazi Ruins, as well as Honey Moon Arch, Skull Arch, and others, time permitting. All scheduling is subject to change depending on weather and participants. On day one we will meet at 4:00 p.m. get to know each other and go over some basic information. We will then have dinner that will be "on me". For the next 3 days we will meet from 3 p.m. to 5 p.m (or up to 6 p.m.) for talks about image acquisition, nightscape processing, Low Level Lighting, etc. This is for anyone interested. You will then be free to have dinner or relax until we again meet up for the nightly expedition. I will do my best to make myself available for individual sessions in the afternoons if anyone is interested. Your travel and lodgings are not included. There are 2 excellent hotels in Monument Valley, The View Hotel (located at the entrance into the park), and Goulding's Lodge (located across the highway). Both are convenient and are very nice. Nearby towns are Kayenta and Mexican Hat. Kayenta is 28 miles South on the same highway as Monument Valley (MV) and Mexican Hat is 26 miles North on the same highway, Route 163. Both take about 30 minutes to reach the entry into Monument Valley. Both have hotels that are less expensive. I have stayed in Mexican Hat and is was no problem driving into MV. To sign up Contact me using the "Contact Me " button in the menu bar at the top of the page. Please let me know which workshop you would like to attend, your email address, and your mailing address. I would also like to personally talk to each participant, so please include you phone number unless you have reservations doing so. Payments will be by PaPal. Contact me using the "Contact Me" button and I will send you the PayPal address for payment. The full tuition is $1995 USD. Once enrolled you need to pay a deposit of $500 USD to secure your spot. The rest needs to be paid 90 days before the workshop date. A full refund is possible up until 30 days prior to the workshop, a 75% refund up to 3 weeks before the workshop, and 50% refund up to 2 weeks before the workshop, none thereafter. The fee includes the workshop and guiding fees, and the dinner on night one. Room and other meals are the responsibility of the individual. The activities are all relatively low key and safe, however there may be some short hikes or scrambling over rocks. No one is encouraged or required to do anything that makes them nervous or uncomfortable. There are many good photos otherwise. If any activity is thought to be outside your range of comfort you must inform me and we will plan accordingly. You are the judge of what you can do! The nearest place to fly into is Flagstaff, Az. or Durango, Co. As I look today, Flagstaff is cheaper. Both are about 3 hr. 15 min way, give or take a few minutes. Albuquerque, NM and Phoenix, Az. are about 5 - 5 1/2 hours away. Salt Lake City is 6 1/2 hours away. Grand Junction, Co is 4 1/2 hours away. 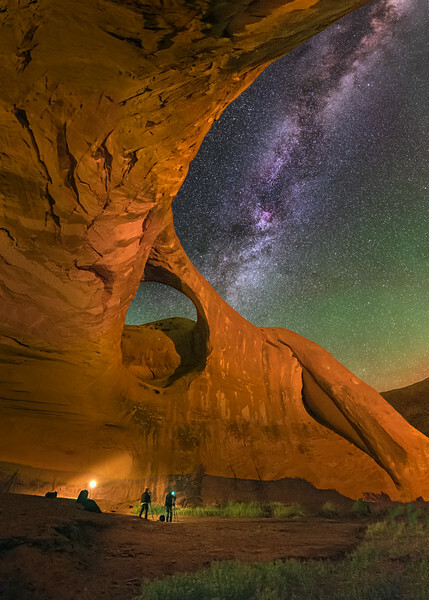 That is a good one if you want to go to Moab as well. Book soon, hotels are filling for 2019!